Responsive themes are getting popular today and many businesses whether solo, partnership or group is having their own websites in fully responsive themes. Responsive themes such as that in WordPress are very helpful for their business because it can be viewed with any devices they use. These themes are created to adopt to the size of the screen and the kind of device the person is using so that it will be viewable in a good and clean way. Responsive themes are the choice of many today and rather than have developers make exclusive themes for starter business, they go with purchasing ready to use themes that are created for their purpose. Real estate business is one that needs a clean and fully responsive design of a website if needed. Since today most products and services are shown online, it is only natural for real estate businesses to have their own. There are different real estate WordPress themes available in the internet but not all of them may suit real estate business. 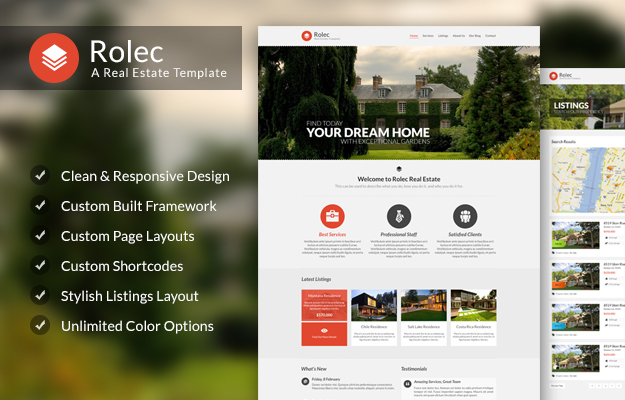 One of them that real estate businesses should look out for is the Rolec theme, a real estate styled theme developed for WordPress users. You can check the demo here. 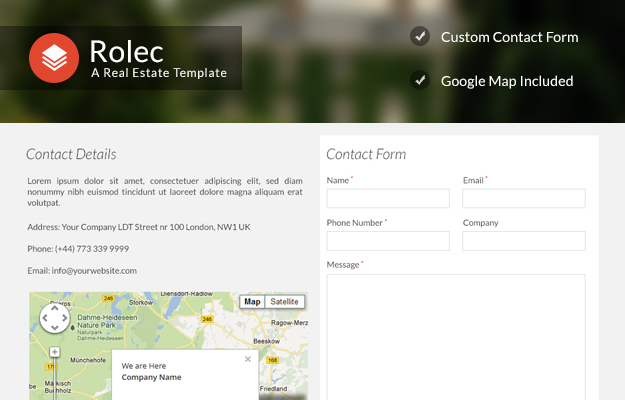 • Rolec theme may be designed for real estate business but it can be used for other purpose as well such as business agencies. The design is simple but modern in look with a Big Slider effect to slide the images of the real estate that users are planning to show when users first visit the website. 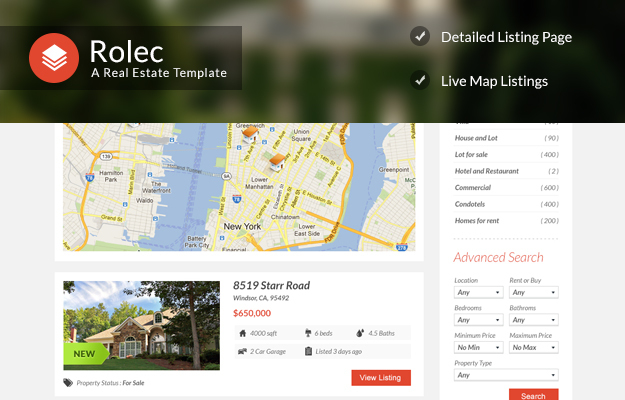 Navigation is simple, introduction to the business is amazingly styled where you can place property listings in it. • It is a fully responsive WordPress theme which means that it will retain its design and style in any device you view it with. It will always look organized whether you view the website in a smart phone, tablet or desktop. 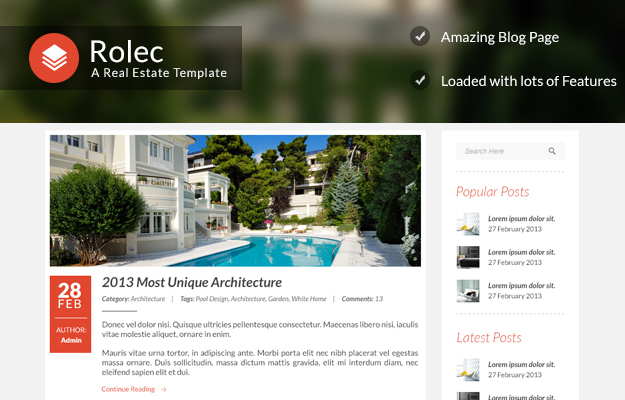 • The Rolec theme is based on the 1140 CSS Framework which gives real estate website that business corporate look. It is easy to install that comes with five customizable color themes. More choices are available in their back-end panel. • It has an advanced search option included in the theme. It enables users to choose detailed search for the property listings in the website where it will return the results that they are looking for. This narrows down the choices they see rather than flipping over many property listings that will take time for the user to find what they are looking for. 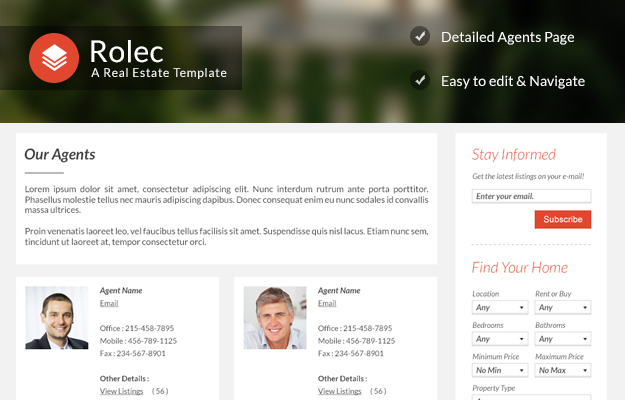 • This theme has an option where the admin of the website can add a property agent and are given the ability to edit and add the property they have. Just imagine an Admin that owns the website while another account for the author who writes the content or their article in it. • It is also built on the ZetaOne framework where it gives full configuration options to owners from changing the logo to specific ones such as managing fonts, layouts, etc. Rolec includes an extensive documentations for owners as reference.